Producers come to us and stay with us for the long term. 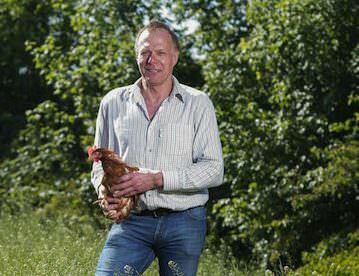 Phil has been a Chippindale free range egg producer since 2009. He moved from pig farming to poultry and is now producing 15,000 eggs a day from a flock of 16,000 free range hens. Our agriculture team helped him with advice and guidance as he set up his production system, poultry shed and progressed through planning. We have continued to work closely together providing advice on choice of breed, feed, management regimes and business support. Phil says: "I really liked the attitude of Nick Chippindale and the entire team right from day one - I could see they were a forward-thinking, growing business with a long history and strong family values. 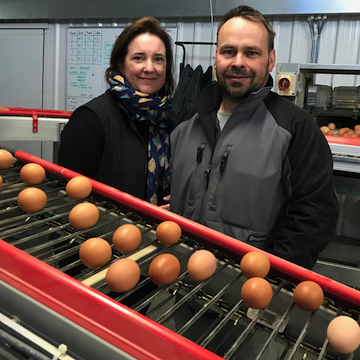 "There was a lot to think about when I started out but I quickly realised that the most important thing is attention to detail in every aspect of egg production. Good welfare and husbandry are essential to peak performance and there are no short cuts." Richard Pearson, Head of Agriculture at Chippindale Foods, says: "By investing time in our relationship with Phil in the early days we were able to support him in his decision making and we have continued to work together to build a long term and successful partnership." Mike started working with Chippindale Foods in 2008 when he took the decision to establish himself as a new free range egg producer. 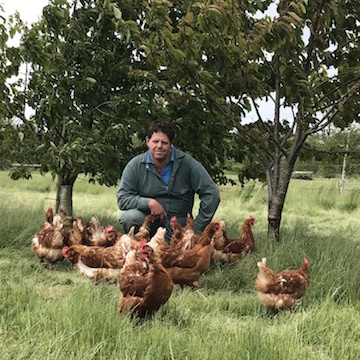 Mike has found that by being able to talk openly and honestly to our team about his ambitions and challenges, he has developed the confidence to expand his free range poultry business. Northumberland farmers Claire and Simon have been living the organic farming life for a number of years and egg production was a natural step for them. They already have a well established organic beef and lamb business and are fully self-sufficient with animal feed, growing all their own organic crops including red clover, white clover, vetch, oats, barley, Lucerne and brassicas. When it came to introducing hens to the family farm, Claire and Simon wanted to do things properly. They chose not to have their first flock beak tipped so they knew they had to create the best possible environment for the birds to keep them happy, healthy and calm. Claire left her job as a surveyor in order to project manage and oversee the development of the building and ranges and she made sure they had the right building and environment for their birds. “Under Freedom Food standards we have to introduce a certain level of enrichment for the hens and we have added three or four times the required level to create the best possible environment and keep our hens content and occupied. The last thing we want is bored hens as that can lead to pecking issues,” says Claire. The enrichment measures include, things to play with and peck at. The birds receive a regular supply of organic feed with plenty of variety in the size and ingredients in the ration to make feeds more interesting as well as providing all the right dietary requirements. The birds also have lighting that can be adjusted with a red light system available as well as music. “Our hens love listening to Classic FM through the integrated music system and we can switch to red lighting if we want to create a calming atmosphere in the shed,” Claire adds. The family are passionate about animal welfare but they also know that when birds are well cared for and fed they are more productive and less prone to disease, which is particularly important in organic farming where medication has to be avoided. Claire and Simon are keen to make their egg enterprise as sustainable as possible and they have installed a wind turbine, low energy LED lighting and solar panels which they hope will ultimately provide all the energy they need to keep the laying shed running. The building is designed with the birds’ environment and welfare at the forefront with an integral muck belt that enables the muck to be easily removed once a week. This keeps the environment in the shed pleasant and also reduces the risk of disease. They use the muck to fertilise the crops. “It’s the perfect circular system, keeping waste to a minimum and using natural resources to maintain a healthy and efficient organic farming environment,” explains Simon. Water is sourced from a borehole and uses a three tier filtration system to purify it. “The hens probably have better quality water than we do in the farmhouse,” jokes Simon. Chippindale Foods has supported Claire and Simon right the way through, from assessing the viability of introducing hens to the farm to planning and preparing for their first flock. This is only their first year of egg production and Claire and Simon now have 12,000 hens alongside their 1,500 ewes, 160 suckler cows and 1650 acres of land in the Northumberland uplands which is predominantly pasture and moorland.